My children love to believe in imaginary worlds. Whether it’s Santa at Christmas, the Bunny at Easter or even the Tooth Fairy, reality becomes a little bit sweeter and more enjoyable when there’s an edge of mystery in the air. One of my favorite mysteries growing up was the unicorn. These beautiful, elegant and mystical creatures were constantly on my mind, and now my own daughter can’t get enough of them. It wasn’t until recently that I found out there’s a whole range of magical unicorn toys available, ready for playing the afternoons away. If you think a unicorn toy is exactly what your daughter is missing from her toy box, take a look at these gorgeous unicorn toys. She’s sure to fall in love with each and every one of them. 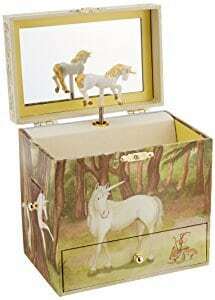 To start with, I’ve discovered this really traditional unicorn music box and it… is… beautiful. I used to love my old music box where I could keep all of my little trinkets. Now your daughter can too. When you open the box, a tiny unicorn figurine pops up and a song called ‘The Unicorn’ plays. This is perfect for just playing around with or as a night time lullaby. The lid of this music box also has a little mirror, perfect for when your little one is putting on earrings or simply wants to see her reflection while the music plays. What's Great About It: At the front, you’ll find a large compartment, suitable for all kinds of treasures and trinkets. But the bit I love the most is the two side drawers. They’re not massive, but it’s more than enough extra room for all your girl’s tiny treasures. With this awesome and unique set, you don’t just get one toy, not two toys, but five plush toys for your children to play with. 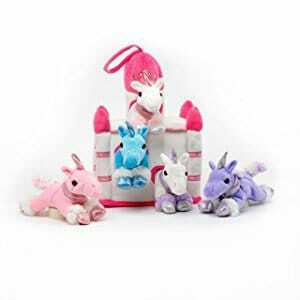 That’s five unicorn plush toys for your daughter to enjoy, all neatly stored in a carry play castle. That makes this set excellent for traveling and playing with in the car, at a friend’s house or at school. Since there are five toys, that makes this set perfect for promoting a more creative style of play, and it won’t be long before each toy has a name of their own. Each plush toy has been made to be super soft and cuddly, and you can be sure this will quickly become an all-time favorite. What's Great About It: Since there’s so much going on with this toy, and so many parts to it, if your children are anything like mine, the toys are going to go everywhere with them. But don’t worry if one of the toys gets a bit dirty, as they’re all completely safe for machine washing. Instead of looking for a whole collection of unicorn toys, you might just be looking for the one, in which case you should definitely consider this beautiful doll from Melissa & Doug. This gorgeous stuffed toy is soft and incredibly lovable. This toy uses the traditional unicorn colors of pink, white and purple, so it looks and feels the part. What’s more, if you look closely, you’ll notice the hooves and the horns have a mystical shimmery shine to them. This only adds to the wonder that this toy provides and it’s sure to be a hit with your daughter at any age. Since this toy is made by Melissa & Doug, one of the leading children’s toy producers, you know you’re getting a toy that can stand the test of time. All of the stitching and seams are professionally sewn, and the entire toy is surface washable. Thankfully, that means the toy won’t get ruined if food or drink happens to get spilled on it. What's Great About It: What I really love about this toy is the fact that the hooves are slightly weighted. 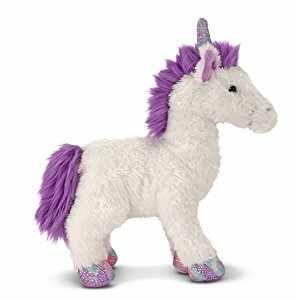 This unicorn plush toy can stand upright all by itself, adding a whole new level to your children’s opportunities to play. I always find that my daughter is drawn to handbags. Maybe it’s a sign for later in life, or maybe she’s just copying me when I go out and about. Either way, she loves handbags. 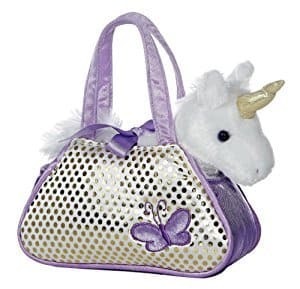 With this in mind, I got her this magical unicorn-styled carrier purse, and she loved it. The purse is perfectly sized for tiny hands and comes in a shimmering, shining design that’s sure to be an instant favorite. Included with your bag, you’ll find a soft and fluffy plush toy that can come out of the bag, or stay in, whichever your child prefers. This is perfect for when your daughter is wearing mommy’s heels around the house or whether you’re out and about during the day. What's Great About It: Due to the nature of this plush toy set, it’s perfect for any time of year, whether it’s a birthday, Christmas, or simply a gift because you feel like treating your little princess. It’s always good if you can find a toy that your children love and can actually provide them with some kind of developmental benefit. That’s exactly what Rock & Glow has achieved here. 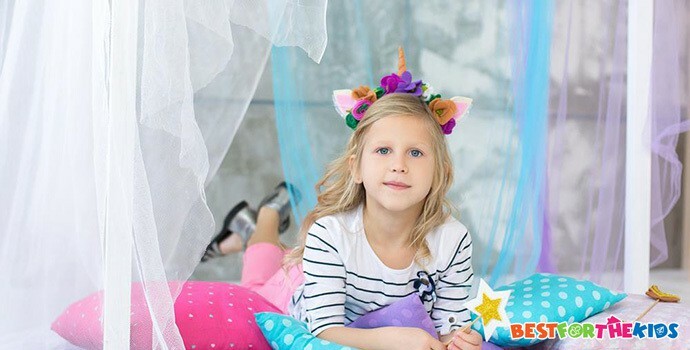 Suitable for younger children aged between 3 months and 6 years, this magical unicorn is overflowing with lights, buttons, and switches that your daughter won’t be able to explore enough. 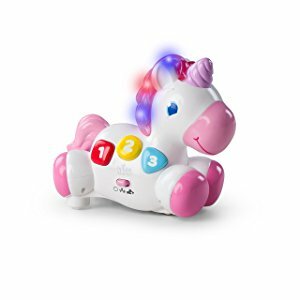 Included with this durable unicorn toy, there are plenty of different modes to try, including the ever-helpful ‘Play to Learn’ mode. When switched on, your little girl will have to identify shapes, colors, and numbers, all of which comes together to create a complete sensory experience. There’s also a very exciting ‘Chase’ mode, where the unicorn will rock around and gallop in all kinds of directions, only changing when your baby touches it. If you’re looking for a toy that can help your daughter learn to crawl, this is it. What's Great About It: The best thing about this toy is that you don’t have to worry about using the modes if you don’t want to. All the lights, sounds, music and buttons work independently, so your children can play to learn, or they can simply play around in their own time to their heart’s content. Mythical creatures? Ancient legendary animals? To some parents, this might all sound a bit too far-fetched. However, consider the books and television programs your children watch. All of them are filled with mystical and magical creatures from the unknown. There are plenty of reasons why you should add to this sense of wonder. By choosing the right unicorn toy, you can use the toy to play along in your story times and during play time. It doesn’t matter whether these creatures and stories are true, or even realistic, what matters is why we parents do it. In short, it’s all about enhancing your child’s imagination. This is all for the same reasons you’d get your little boy a toy car, or all children a teddy bear. All your children need to believe that a unicorn exists is their imagination. To make this a reality, your children’s brains require a rather complicated cognitive process. In their brains, this sense of imagination touches on their logic, memory and their experience. All of this combined can help you to improve their creative thinking skills as well as their creative problem-solving skills. These are extremely beneficial traits that should be taught as young as possible. With all of this in mind, what makes a unicorn toy so great is the fact that it becomes very relatable to your child. Every child loves a toy, especially a cuddly, soft toy and, as you can see from my list, there’s plenty to choose from. As with any toy, the more cognitive benefits that the toy provides, the better the toy is. Additionally, without your children even realizing it, the more cognitive it is, the more entertaining they will find it since it’s engaging their brains. It’s amazing how long unicorns have stood the test of time. By taking your time in choosing the right toy, you can be sure that you’re giving your child the best experience possible, both in terms of entertainment and education.